On today’s episode, we discuss the new keyhole garden. You will learn about the design and how we are using it here at the Farm to grow fresh food. If you would like to have your own keyhole garden, kits are available at Gardener’s Supply. 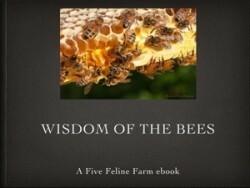 Every week brings something new at Five Feline Farm. This past week presented challenges for us and we share a couple on this episode. Understanding the “why” behind anything you do is important. It drives your decision making and keeps you focused on your purpose. On today’s podcast, we talk about some of the “why” behind Five Feline Farm. On this episode, we share a few tips about how we work and structure our days to get everything done. Building a business is hard when you work full time.